A hero to many, Luis Suarez hit home not once, but twice to cancel out a late Wayne Rooney equalizer as Uruguay thwart England in Sao Paulo. The sides sung their nation anthems and the game was underway! Two nations come together to support their team. A first glimpse of Luis Suarez as the Liverpool striker did a cheeky one-two then entrerd the box but Gary Cahill headed the ball out. Nearly 10 mintues in and a Wayne Rooney free-kick just crept wide of the post. A great chance after Godin conceded the kick with a hand-ball and the Uruguay defender was also booked. Uruguay come close as Glen Johnson sloppily knocks the ball to Christian Rodriguez on the left and he hits it with force but it travels over the cross bar. Near chance for Rodriguez and Uruguay. 27 mintues in the game, a low corner boxed in outside the area and Edinson Cavani gets on the end of it but blasts the ball just over Joe Hart's crossbar. The first 30 mintues of the match was fairly even as both sides had plenty of possession but it was Uruguay who enjoyed having a few more chances. They weren't able to convery them but they are definitely looking better than they were in their game against Costa Rica which they shockingly lost 3-1. Possession stats for first half an hour and 7 minutes were URU 41%, ENG 59%. Wayne Rooney's header strikes the cross bar as a looping free-kick from Steven Gerrard beats the Uruguay keeper at the back post. Rooney comes so close to getting his first World Cup goal but the cross bar denies him. Uruguay were the team that struck first as a counter attack that saw England's defence flop, it was none over than Luis Suarez who headed home a world class Edinson Cavani cross from close range. Nonetheless, a great header by Suarez who directed it straight past Joe Hart, giving Uruguay a 1-0 lead just 6 minutes from half time. Uruguay 1-0 England. It was a shaky start to the second half for England, as Uruguay picked and poked at their defence. In the first half, Luis Suarez nearly ciahgt out England goalkeeper Joe Hart with a low corner and it happened again The ball almost crossed the line but Hart patted it away. Awful defending from England. Some awful England defending comes to show as Uruguay rip through the back four. Edinson Cavani was played in one on one at a slight angle but a goalscoring postiton. The Uruguay striker put the ball wide and England survive the additional onslaught. After a shaky start to the second half, England were just able to get forward as a low cross into the box finds Wayne Rooney but the Manchester United striker thumps the ball at the Uruguayan keeper. Very, very close to an equalizer. Some good play by England. 75 minutes gone and an England goal finally got a well deserved goal. After a great run from right back Glen Johnson, twisting and turning past the Uruguay defence he slid the ball into Wayne Rooney and the Man Utd star struck home from close range. What a moment for England as they get themselves back in the game. About 8 or so minutes after Rooney's equalizer, Uruguay hit back after the goalkeeper's long kick forward, Edinson Cavani heads on to Luis Suarez and the striker for Liverpool blasts home past Joe Hart. A true hero for Uruguay and their supporters as he takes them into a 2-1 lead. 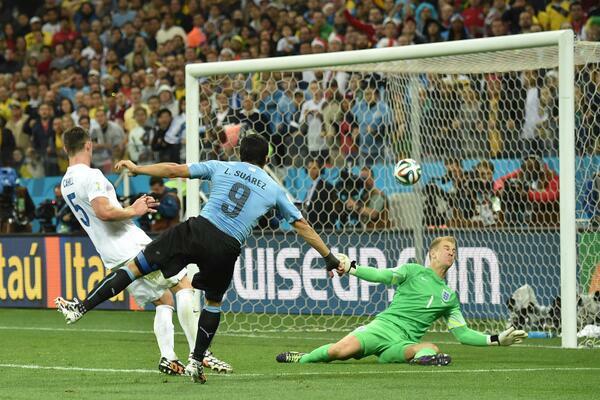 Man of the Match: Luis Suarez, two great goals to salvage URU win. Flop of the Match: Edinson Cavani misses a golden opportunity. After defeat, England now have to beat Costa Rica and rely on two Italy wins. Can they do it? Uruguay and England meet in a mouthwatering Sao Paulo clash after both lost their first games in Group D of the 2014 FIFA World Cup.